If you’ve been in business long enough to exchange goods or services for money, you might have run into the hassle of being asked for a refund. Having been on the inside of product and service based businesses, I can tell you that it’s not pleasant, or easy, for anyone to navigate those waters. What do you do? What ground (if any) do you stand on? Further still, what if the customer makes demands you aren’t ready to meet? Owning your own business and selling your stuff means business can easily feel incredibly personal (I know. My domain name is my freakin’ name.). An email from a coaching client who says “I am not thrilled with our sessions so far and want a refund. I’m an unhappy customer” does not need to mean you run for the hills and throw all of your money over you shoulder on the way out of town. A note from a photography client demanding a disk of all of the images you shot doesn’t mean a night spent rendering files to make her happy. Not as long as you have policies in place to protect your business and your sanity. Repeat after me: I am not a mean person for standing by my business. I will work to find resolution, not to be a doormat. 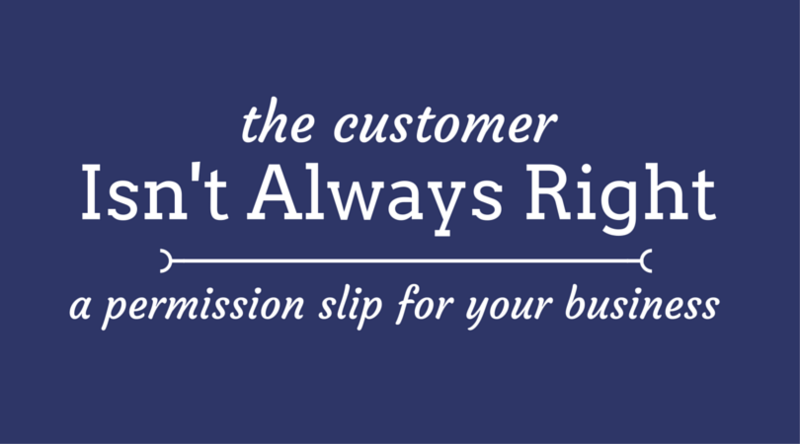 You don’t have to be a doormat to provide good service! Creating a stand out customer experience isn’t about a “whatever it takes” attitude (unless that’s true to your brand). It’s about building a foundation for a long term mutual respect and admiration, even when the buyer might not have had their best experience with you. In any exchange of time, services, or goods, a solid set of policies can save your hide (and your business) IF they are in place before the transaction begins. Do you have policies in place (or are you waiting for the other shoe to drop)? 1) Copy/paste policies directly from Google or (a step up) from swipe copy inside a paid program written by a lawyer. 2) Write policies on the fly as they come up, but never sooner. Do you find yourself in either of those camps? Here’s the good news: you are not alone. We’ve all been there, done that. Probably all of it, maybe at the same time. For #2, you’re left being reactive instead of proactive, adding to your list of policies (most likely) after you’ve been thru the ringer on a particular topic. Maybe someone copied your work or requested a refund after the product was delivered or wanted to reschedule an appointment with no notice. Hey hey! Time for a new policy! Let’s jot that one down…. Oy. Now here’s my big ol’ disclaimer: I AM NOT A LAWYER. I’ll leave it to you to find one who can help you get your documents in a row. But do that, okay? Cool. Carry on. Want the better news now? You can create policies that feel and act like your brand AND provide you with another level of customer service before you ever need it. In fact, we dive into this even further inside Module 2 of Your Signature Experience. Because when you pay attention to every inch of your customer’s experience of your brand, you show them that they matter. By putting policies in place, you tell your customers you are professional, you have considered all of their needs (even the unlikely ones), and building trust becomes thatmuch easier. Want the worksheet to get your policies nailed down once and for all? Join us inside Your Signature Experience for branded policies, a stand out customer experience, and so much more.